In modern societies, cultural change seems ceaseless. The flux of fashion is especially obvious for popular music. While much has been written about the origin and evolution of pop, most claims about its history are anecdotal rather than scientific in nature. To rectify this we investigate the US Billboard Hot 100 between 1960 and 2010. 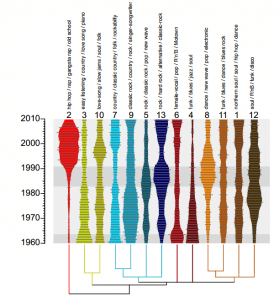 Using Music Information Retrieval (MIR) and text-mining tools we analyse the musical properties of ~17,000 recordings that appeared in the charts and demonstrate quantitative trends in their harmonic and timbral properties. We then use these properties to produce an audio-based classification of musical styles and study the evolution of musical diversity and disparity, testing, and rejecting, several classical theories of cultural change. Finally, we investigate whether pop musical evolution has been gradual or punctuated. We show that, although pop music has evolved continuously, it did so with particular rapidity during three stylistic “revolutions” around 1964, 1983 and 1991. We conclude by discussing how our study points the way to a quantitative science of cultural change. 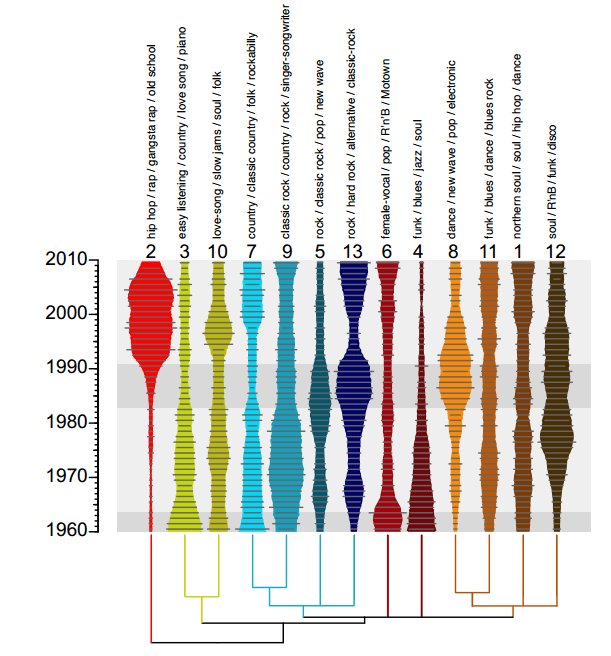 Be the first to comment on "Genetic Data Tools Reveal How Pop Music Evolved In The US"